Every year, as we do our recap of social media trends, we have a chance to review the landscape that’s changed before our eyes, and in 2016, social media networks had a big year. There’s so much to discuss within this 2016 social media wrap-up: Big Data is a major player in the social landscape as businesses and marketers are closely examining the behavior of their target audiences; the Internet of Social Things has joined the IoT conversation as products like the Apple Watch have taken center stage; ecommerce and mcommerce integration are becoming seamless on many social networks, and some social networks are beginning to act as payment gateways themselves on external websites; with a continued interest in privacy, users are sharing less personal information publicly and utilizing either closed messages for this purpose like Facebook Messenger or networks with disappearing posts like Snapchat. We could go into the impact of social media on the 2016 American elections, but we’ll save that one for a different conversation—perhaps a private one to go along with this year’s trends. Facebook is the social media goliath that continues to grow but that increasingly baffles businesses and marketers. With updated algorithms, Facebook has shifted what users see, and business pages are increasingly finding the need to use “boosted posts” or run ads to catch the audiences that they were organically reaching only a year or two ago. Recent studies even show that Facebook posts with hashtags are actually less discoverable. This combined with the inability for a business page to live-stream video like individual or celebrity users can (unless the page is a verified business page, a distinction difficult to achieve at this time) has a lot of marketers scratching their heads and wondering what the future of Facebook marketing will be. Business pages did gain some new tools in 2016, including the ability to send Instant Replies through the increasingly popular Facebook Messenger, and on the ecommerce side, the capability for payments and donations to be made directly through Facebook. The latter, especially, is huge. Facebook isn’t going anywhere anytime soon, but marketers definitely need to stay on top of their strategies with this ever-evolving network. “1.18 billion daily active users on average” (Facebook, 9/2016). “1.09 billion mobile daily active users on average” (Facebook, 9/2016). “1.79 billion monthly active users” (Facebook, 9/2016). 79 percent of Internet users (68 percent of all U.S. adults) use Facebook (Pew Research Center). Facebook users now see 100 million hours of video daily (Techcrunch). “There are 50 million active small business Pages” (Techcrunch). As of January 2016, “8% of Facebook users were between 13 and 19 years old, 28 percent were between 20 and 29 years old, 21 percent were 30 to 39 year olds, 16% were 40 to 49, 13 percent were between 50 and 59, and 13 percent were 60 or older”(Statista). 86% of social marketers regularly use Facebook ads (Social Media Examiner). In 2016, Instagram stepped into the slot of number 2 social media network for internet-using Americans, passing Pinterest, which held the spot in 2015. A picture may be worth a thousand words, and this is the website that has proven how much people have to say through images. While advertisements in Instagram can have a “buy” button to send a user directly to where they can purchase a given item, rumor has it that they are presently building an ecommerce team in New York to enable these transactions to take place within Instagram (without sending users off of the site). There are “more than 500 million Instagrammers—more than 300 million of whom use Instagram every single day” (Instagram, 6/2016). 32% of online adults use Instagram (Pew Research Center). 26% of online men and 38% of online women use Instagram (Pew Research Center). 59% of 18 to 29 year olds use Instagram, as do 33% of 30 to 49 year olds, 18% of 50 to 64 year olds, and 8% of those 65 and over (Pew Research Center). “68% of Instagram Users engage with brands regularly, and furthermore, Instagram has 58x more engagement per follower than on Facebook” (Selfstartr). Almost half of total Internet users have an Instagram account (Global Web Index). The average Instagram user spends 25 minutes per day on the platform (KPCB). Pinterest is holding strong and steady, with no major user growth in 2016, but no major loss either. A major development overhaul has taken place in the past year, working to make Pinterest smoother, faster, and more focused on subtleties that will appeal to international audiences, but for most visitors, the behind-the-scenes changes have been unnoticeable. 45% of online women use Pinterest (Pew Research Center). 17% of online men use Pinterest (Pew Research Center). Pinterest boasts 100 million active users (Pinterest Blog, 6/2016). 55% of American online shoppers pick Pinterest as their favorite social media platform (Business Insider). 67% of Pinterest’s users are Millenials (Chain Store Age). The average time spent on Pinterest per day is 21 minutes (Simply Measured). There are over 2 billion searches per month on Pinterest (Simply Measured). Although LinkedIn is one of the older social networks, debuting way back in 2003 (eons ago in the digital age), it is a professional force that is presently unmatched for what it offers. Despite its waffling over hashtag use (utilizing them early on, deeming them worthless for years, and now slowly enabling hashtag searches via the mobile app and potentially desktop searches soon), its slow and steady growth has made it an esteemed network with a reputation people have come to rely on. 467 million users are on LinkedIn (LinkedIn, 9/2016). 29% of online adults are on LinkedIn (Pew Research Center). 31% of online men are on LinkedIn (Pew Research Center). 27% of online women are on LinkedIn (Pew Research Center). 50% of online adults with a college degree or higher education are on Linkedin, in addition to 27% of online adults with some college education and 12% with a high school degree or less (Pew Research Center). There have been 10 billion endorsements on LinkedIn (VentureBeat). Two new professional accounts are created every second (LinkedIn, 9/2016). The fastest-growing demographic on LinkedIn is students, with 40 million student and recent graduates having accounts on the platform (Simply Measured). Marketers that flesh out their Products and Services page have twice as many company followers (Simply Measured). 40% of B2B marketers say that LinkedIn is the most important platform for them (Social Media Examiner). This has been an interesting year for Twitter from the rise of its live-streaming video app Periscope to its shutting down of Vine to its dropping of images and (possibly) hyperlinks from its character limit count restrictions—not to mention the conversations stirred by tweets from presidential candidates or major layoffs within the company. Users have learned that to gain a strong presence on Twitter, more time is required than on many of the other social networks, but if done well, one can initiate true conversations with the world—at least, that’s the feeling at present. Some argue that this tide is turning, but time will tell. There are 317 million registered users on Twitter (Venturebeat). 24% of online adults (21% of Americans) use Twitter (Pew Research Center). Male and female users are roughly equal, with 24% of online men and 25% of online women using Twitter (Pew Research Center). “Twitter has about 317 million monthly active users” (VentureBeat). “82% of active users access the site via mobile” (Twitter, 11/2016). 40% of the users of Twitter follow others but never tweet themselves (StatisticBrain). On average, 9,100 tweets are sent every second (StatisticBrain). Almost 50% of active Twitter users follow brands/companies (Convince&Convert). Over 40% of Twitter users learn about products and services via Twitter (Convince&Convert). One in three Twitter users watch videos on Twitter (Global Web Index). 18% of social marketers regularly use Twitter ads (Social Media Examiner). Whatever the original goals of Google+ may have been or whatever its goal has evolved into over the years, it hasn’t quite gained the prowess of its parent company; however, as we’ve argued for years, Google+ remains a powerful business tool when it comes to Search Engine Optimization (SEO). Since the word “google” has turned into a verb meaning to search for something online, it’s no surprise really that businesses and individuals who are active with a Google+ page will often fare better in online searches than those without. Every Gmail address has a Google+ account, which is why Google+ officially has over 2.5 billion users (Tech Times). There are 540 million active users on the platform (Simply Measured). 62% of Google+ users are B2B marketers (Simply Measured). 22% of online adults use Google+ more than once a month (Simply Measured). 49% of digital marketers use Google+ (Social Media Examiner). There are roughly 7.4 billion people in the world. 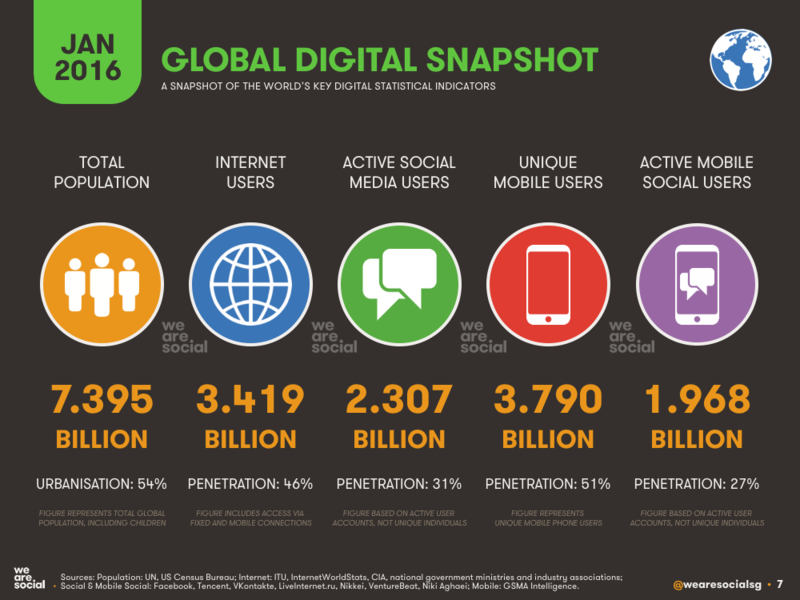 3.14 billion are internet users, and of these, 2.3 billion are social media users. No business or brand has the time to tackle every social media network out there, but choosing the one(s) that make the most sense for their target audience and their marketing strategy can have a huge impact. Personal recommendations continue to rank more powerfully than anything else, but creating a presence on social media that audiences can connect with is more important than ever.